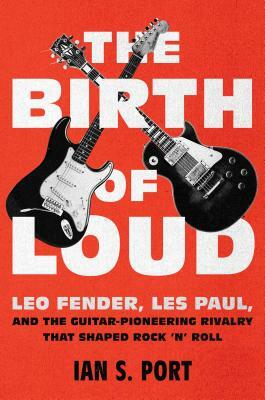 Join us at Book Culture on Columbus as Ian S. Port discusses his first book, The Birth of Loud: Leo Fender, and the Guitar-Pioneering Rivarly That Shaped Rock 'n' Roll,on Tuesday, January 15th at 7pm! A riveting saga in the history of rock ‘n’ roll: the decades-long rivalry between the two men who innovated the electric guitar’s amplified sound—Leo Fender and Les Paul—and their intense competition to convince rock stars like the Beatles, Jimi Hendrix, and Eric Clapton to play the instruments they built. In the years after World War II, music was evolving from big-band jazz into the primordial elements of rock ’n’ roll—and these louder styles demanded revolutionary instruments. When Leo Fender’s tiny firm marketed the first solid-body electric guitar, the Esquire, musicians immediately saw its appeal. Not to be out-maneuvered, Gibson, the largest guitar manufacturer, raced to build a competitive product. The company designed an “axe” that would make Fender’s Esquire look cheap and convinced Les Paul—whose endorsement Leo Fender had sought—to put his name on it. Thus was born the guitar world’s most heated rivalry: Gibson versus Fender, Les versus Leo. While Fender was a quiet, half-blind, self-taught radio repairman from rural Orange County, Paul was a brilliant but egomaniacal pop star and guitarist who spent years toying with new musical technologies. Their contest turned into an arms race as the most inventive musicians of the 1950s and 1960s—including bluesman Muddy Waters, rocker Buddy Holly, the Beatles, Bob Dylan, and Eric Clapton—adopted one maker’s guitar or another. By the time Jimi Hendrix played “The Star-Spangled Banner” at Woodstock in 1969 on his Fender Stratocaster, it was clear that electric instruments—Fender or Gibson—had launched music into a radical new age, empowering artists with a vibrancy and volume never before attainable. Ian S. Port is an award-winning writer and music critic whose work has appeared in Rolling Stone, Village Voice, The Threepenny Review, and The Believer, among others. He is also the former music editor of the San Francisco Weekly. A California native and lifelong guitar player, he now lives in New York with his wife, Lindsay. The Birth of Loud is his first book.